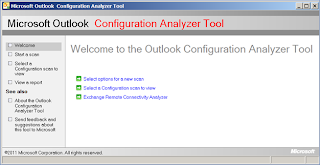 The Outlook Configuration Analyzer Tool (OCAT) provides a quick and easy method to analyze your Microsoft Office Outlook profile for common configurations that may cause problems in Outlook. This can be very useful for busy Help Desk personnel when end-users call for help with Outlook or when you want to identify possible issues with Outlook proactively. 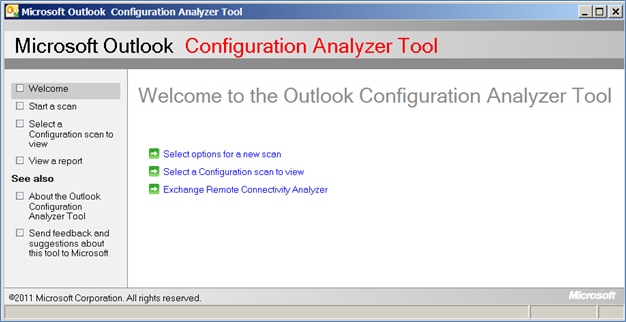 It works only with Windows 7 , Microsoft Outlook 2007 and Microsoft Outlook 2010 [ 32 bit | 64 bit ] . It also requires .Net framework ( Minimum Microsoft .NET Framework Version 2.0 ) .You can get OCAT from here.